Step by step, all key applications shall be replaced with Free Software solutions until the city finally replaces its currently running Windows-system with a suitable GNU/Linux-system. Therewith, Barcelona is heading to achieve and guarantee "complete technological sovereignty" for the municipality. By spring of 2019, when its municipal term of office ends, the City Council has planned to spend 70 percent of its software budget on open-source software. With this in mind, Barcelona has been the first city council to sign the Open Letter of our "Public Money? Public Code!" campaign. The FSFE is very pleased to see one of European's biggest metropolitan areas moving to Free Software, and we wish Barcelona much success! 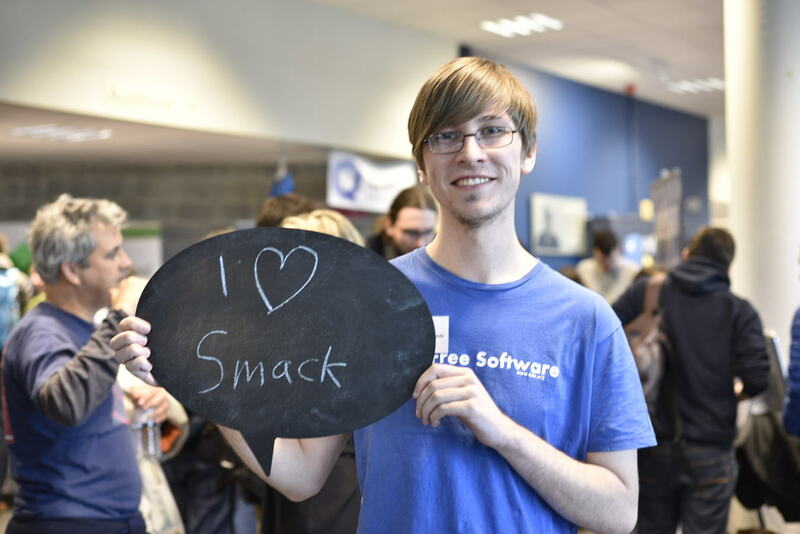 Every year, our community celebrates "I Love Free Software Day" on February 14. Our report from this year's celebration is coming soon but we like to say thank you for hundreds of love declarations via social media channels, pictures of people celebrating their favourite Free Software projects like Developers Italia, beautiful artworks like the one from Grise Bouille as well as multiple blog posts informing about the benefits of Free Software. We even found people opening issues on project's development platforms, just to say "Thank You!" on "I love Free Software Day". Thank you for celebrating with us and stay tuned for the detailed report coming soon. Join our community of freedom fighters. The day before FOSDEM, the FSFE once again partnered up with OpenForum Europe for the third edition of European Free Software Policy Meeting to discuss the most important current policy issues on European level regarding Free Software. The FSFE country team Italy is running an "Ask your candidates" campaign and sent a set of questions about the use and promotion of Free Software to the participating parties of the Italian national elections, happening on March 4. The "besondere elektronische Anwaltspostfach (beA)" is publicly financed software aiming to establish a secure communication between lawyers in Germany from January 2018. Its usage, however, is currently being withheld for multiple security issues. The FSFE published an open letter to demand the full publication of beA under a Free Software license. At the 34th Chaos Communication Congress the FSFE, together with EDRi, set up a cluster called “Rights & Freedoms” with its own freedom related track. Erik Albers wrote a report about it on his blog. Daniel Pocock, the FSFE community representative, writes about Everything you didn't know about FSFE in a picture in which he analyses overlapping relationships between staffers, Council, community and the General Assembly. Daniel Pocock distributed an email to the FSFE community in that he reflected the GA membership process, the FSFE's identity process and his personal travels. Polina Malaja, the FSFE's policy analyst, writes about our response to the PSI Directive public consultation that in short asks to include source code into the list of re-usable public sector information. We are happy to see a first local FSFE meet-up happening in Madrid, Spain, on February 22 and on March 3. We wish all participants to spend their time at the meet-up in a positive and fruitful manner. If you are from the area, do not miss it. By the way: If you miss a local FSFE group in your area but you like to start one, get in contact with our community coordinator Erik Albers who is happy to help you with the first steps. Have you found an interesting Free Software story online that you would like to share? Maybe you have a question that you like to discuss with other Free Software activists? Or you like to announce your upcoming Free Software event or report about a recent one? Then post it on one of our public mailing lists and share it with the community! We currently have active public mailing lists in English, German, Spanish, and Greek. If you live in Italy, contact your local candidates during their current election-campaigns, point them towards our "Public Money? Public Code!" campaign and ask them the questions that we have also sent to the participating parties or similar ones.